As part 2 of “Maybe No Go” begins, The Monarch and 21 fight with, and turn the tables on, Redusa, who, we learn, isn’t even a member-in-good-standing with the Guild. She’s an outlier and an obvious has-been, but she’s still in line before the Monarch to arch Rusty. As 21 points out, the Monarch could “legally” kill her, but instead they let her off with a shrunken head, and, as mentioned before, a collectable free pen just for signing the waiver. 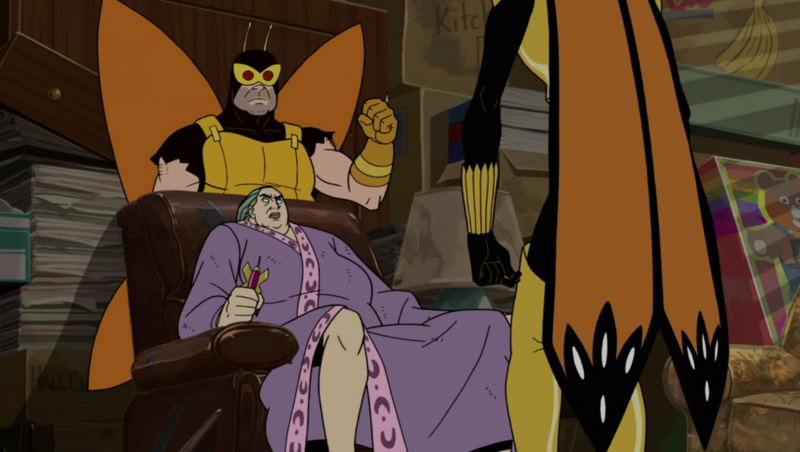 As one of the few beats of actual supervillain action in the episode (the big set piece is still to come), it’s notable that the Monarch does very little in the scene but grouse and intimidate; 21 does all the heavy lifting of thwarting and threatening. 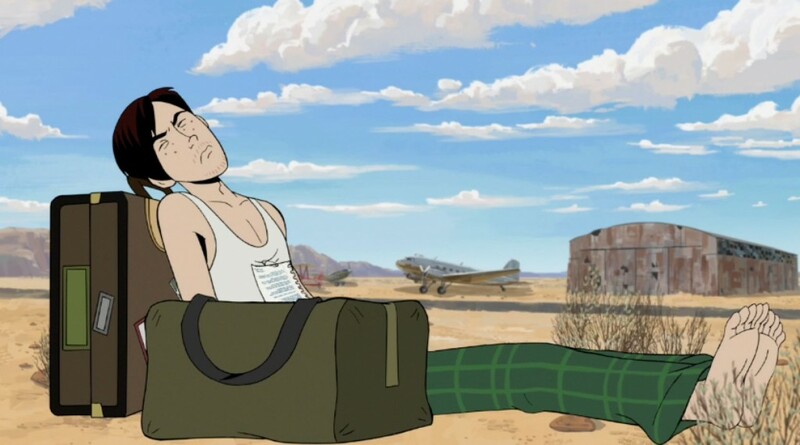 Out in the desert, the A-story of the episode begins with Billy Quizboy and Pete White experimenting with putting mouthwash in cookie dough (presumably for a cookie recipe). This experiment is taking place in their ancient trailer, under the broken neon sign advertising their company Conjectural Technologies. Obviously, business has been slow since the Ventures moved to New York, and no worthwhile inventions are coming down the pike. Into this threadbare idyll comes a Truckasaurus operated by Augustus St. Cloud, the creepy collector of classic pop-culture memorabilia who has taken it upon himself to arch Billy Quizboy. “To the Quiz-Cave!” exclaims Billy, and we next see the opening titles to what I take to be an imaginary kids’ show starring Billy and Pete “The Pink Pilgrim,” done in the Hanna-Barbera style of the 1960s. The question is, if the show is imaginary, who is imagining it? 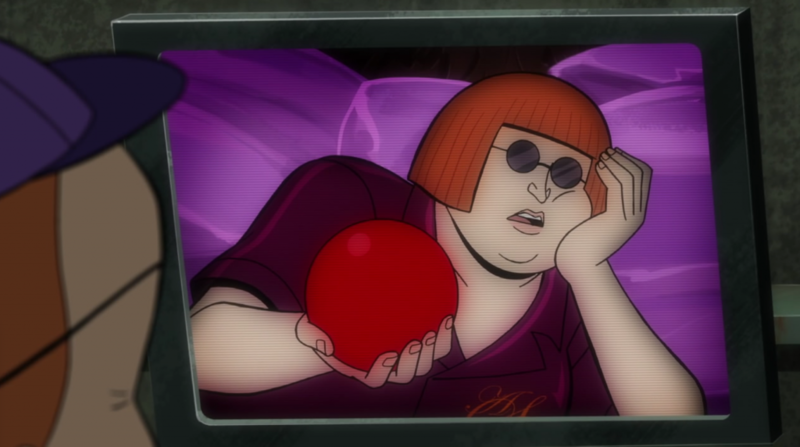 My guess is Billy, who has lived too long in the shadow of Rusty Venture, who, even though he’s miserable because of it, once had his own TV show when he was a child. In taking on St. Cloud as an arch, Billy is, in his own way, getting out from under Rusty’s shadow and “getting his own show.” The entertainment of Billy’s childhood got into his system so completely, he’s willing to risk everything for a chance to join the party, as it were, and become his own super-science crime-fighter. His fantasy is involved enough that, the next time we see him, he and Pete and their robot assistant are in the aforementioned Quiz-Cave, in their super-hero costumes, struggling to defeat the Truckasaurus attacking their trailer. The interesting thing about the scene, and the “Quiz-Cave,” is that, unlike, say, Batman and Robin going to the Batcave, where they analyze clues and hop in the Batmobile, the Quiz-Cave is entirely defensive in its effect. Even in his fantasies as an adventurer, Billy’s tendencies are inward. The Truckasaurus, it turns out, is a mere distraction. Under this noisy cover, St. Cloud has stolen from Billy and Pete what appears to be a red rubber ball. Only a red rubber ball, but to Billy and Pete it’s “the holiest of holies” and “the source of all our powers.” The question of what exactly this ball is and what is its worth becomes the linchpin of the A-story. 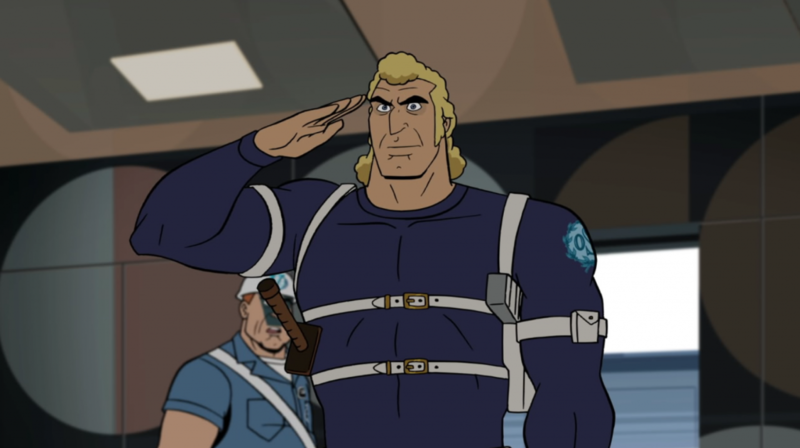 Brock’s reappearance as the Ventures’ bodyguard very much indicates a fresh start for the series. And yet no fresh start in the Venture-verse is without casualties. In this case, Brock’s reinstatement means reassignment for Sgt. Hatred. A nobler character would take the change in stride, but Sgt. 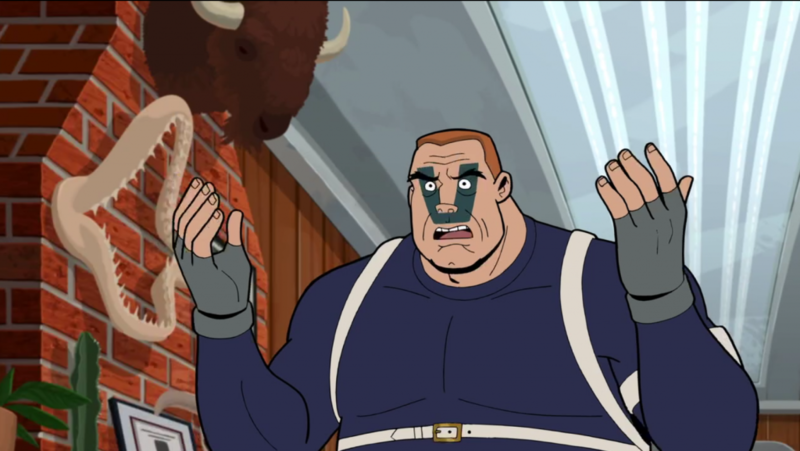 Hatred is not a nobler character, and the sight gag alone of the cut between Brock, above, and Hatred, below, is indicative enough of the two men’s characters: Brock is cocksure, respectful and upright, and Hatred is hunched, defeated and whining. 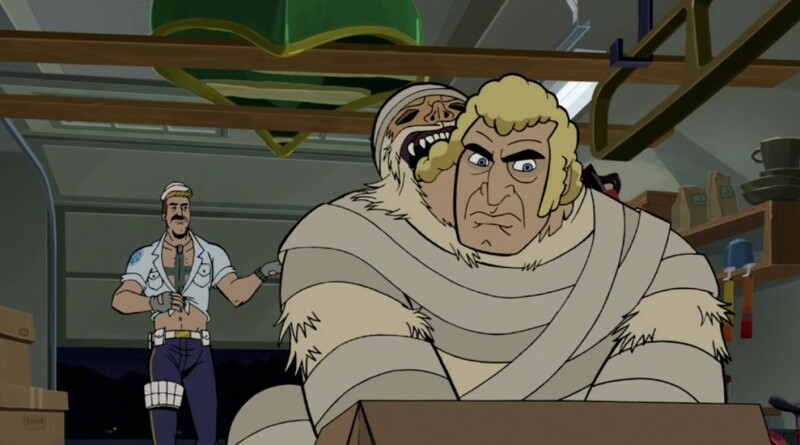 He not only doesn’t take the setback easily, he refuses to take it at all, and stays on as the Venture’s unassigned stalker-bodyguard, sneaking around the Venture building and spying on the other security forces, looking for errors, echoing the more comic tension between HELPeR and the J-bots. 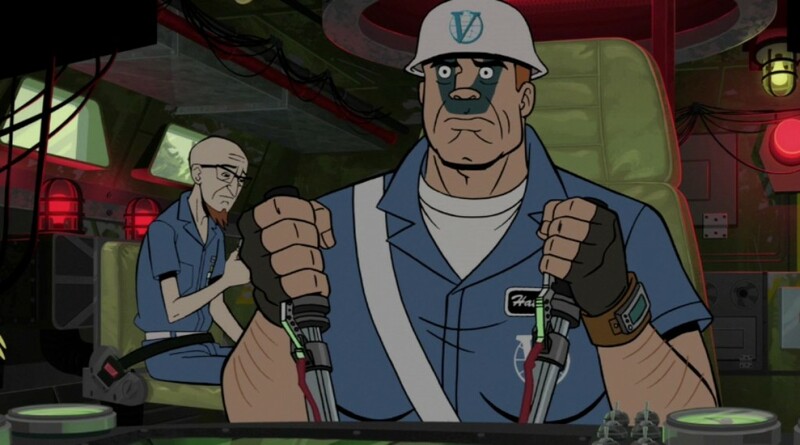 It is a new season of The Venture Bros, and so it is time to once again ask “What does Rusty want?” “Hostile Makeover” answers the question before the titles even begin. Rusty wants his dead brother’s money, and receives it. Having outlived both his distant father and his parasitic twin, Rusty, who has lived in the past for so long, now has a new fortune to squander, and a new place to squander it in. Having been trapped since childhood in the dark, backward 1970s-Hanna-Barbera-netherworld of the Venture Compound, Rusty now has his own high-rise building smack on Columbus Circle in up-to-the-minute New York City. Now, perhaps, we can see him age in a 2010s-era Manhattan penthouse as his shiny new surroundings gradually get old and then burnish into nostalgia. The Monarch finally has his prey, Dr. Venture, where he wants him. After much deliberation over a long list of choices, he decides to use “the bell.” Unfortunately, Rusty is, apparently, partly deaf due to years spent on his father’s jet. Meant to be used as a marital aid, he instead becomes a cockblock. “The Devil’s Grip” has four major protagonists: Sgt Hatred, Col Gentleman, the Action Man, and The Monarch. 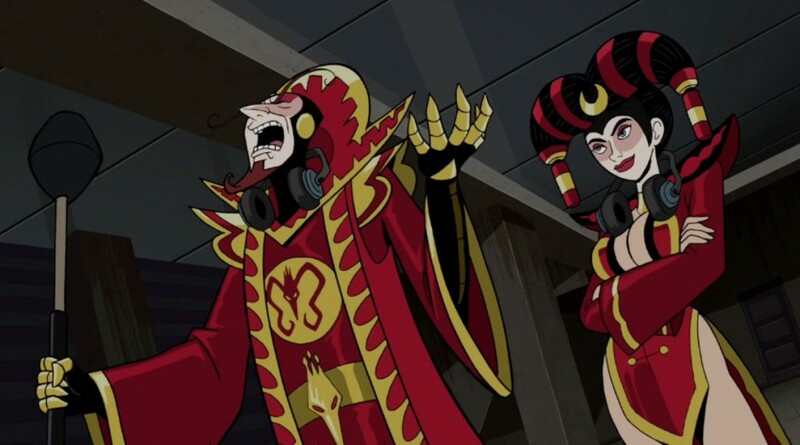 Two of these characters are decidedly minor in the Venture universe, another is an arch turned guardian and the last is a straight-up villain, the villain of the series. 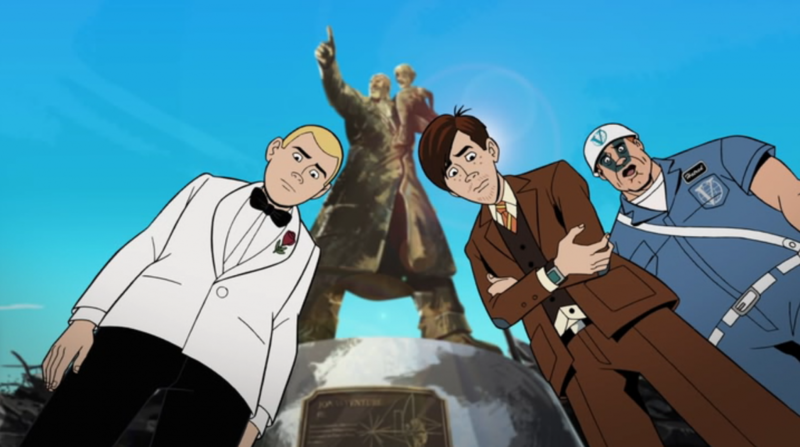 Their stories are intertwined in this episode around the theme of “regret.” Hatred regrets giving up his job as guardian, but is then moved to rescue Dr. Venture by his default-setting of “soldier.” The Action Man regrets not living a more square life and is moved to action by the presence of Hank in his life, Col Gentleman just plain regrets, and The Monarch starts at a place of ultimate power (for him) and slowly slides toward regret. Regret, in this episode, leads to nostalgia, a form of homesickness, and leads in all cases to comings home. “The Return Home,” in all cases, is not presented as a retreat but as a gesture of healing, a symptom of wisdom, a reassessment of each characters’ place in the universe. 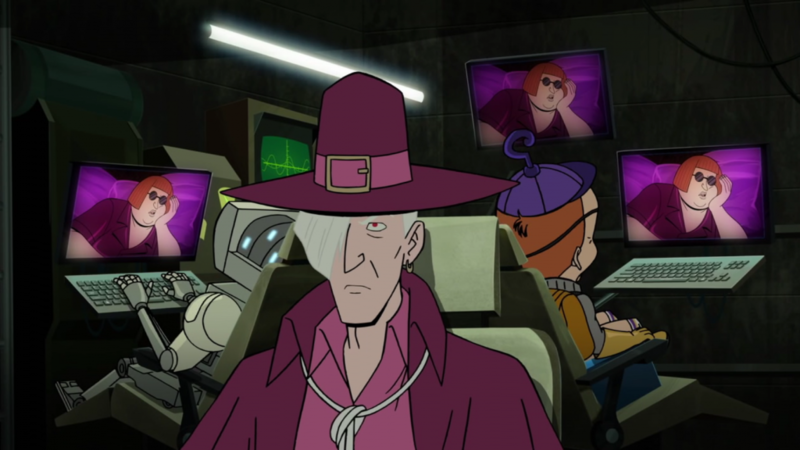 Brock’s mission is now “to save Ghost Robot,” which seems big of him, considering that he doesn’t seem that attached to Ghost Robot, considering that no one seems that attached to Ghost Robot, really. Brock’s passion here is for his work, his job, the job for which he has forsaken his family, the Venture clan, for SPHINX, which has been destroyed by his foster father figure, Hunter Gathers. Brock’s job is his family, and it’s the only thing he’s good at. 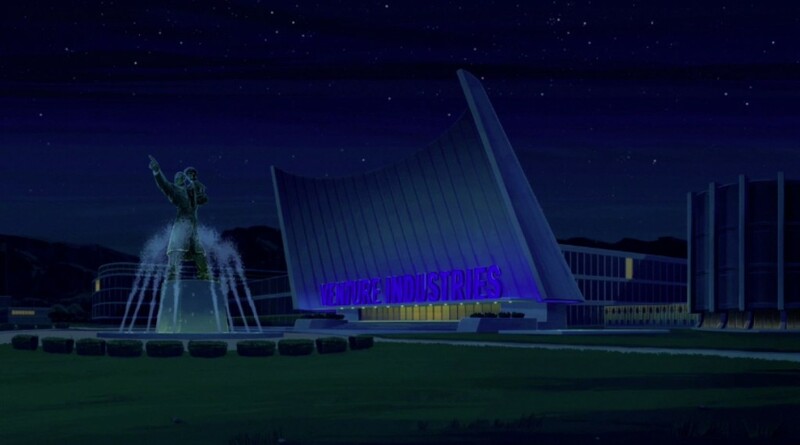 He can’t win at love, he’s backed away from being a father, he’s distant with his work brothers (he even steals one’s wife), but his job is everything to him, an all-or-nothing proposition, even when “the job” is nothing more than invading a nightclub to rescue a robot from an awkward date. 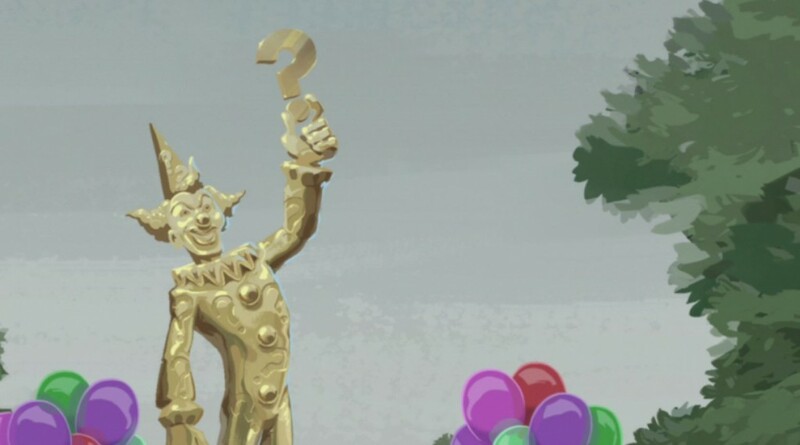 The Clue Clown wields his question mark for good reason. We were only just introduced to his existence, and now he’s gone, leaving nothing but questions. Who was he? What did he stand for? What were his hopes and dreams? Those might be questions too silly to ask of a farcical one-joke supervillain, but the funeral of the Clue Clown is treated with a somberness rare for a Venture Bros death. We barely knew the Clue Clown, the script seems to say, but then, how well do we really know anyone? The death of the Clue Clown sends a whole tributary of minor Venture characters into a whirling tailspin of reflection, sober and otherwise. And, like all funerals, it provokes death’s opposite: lust. What better protest against death could there be than the seeking of carnal fulfillment? In this case, having the lovers seeking their carnalities in bodies of metal. When reasonable people gather to discuss Batman, at some point someone clears their throat and says “Well you know, according to some schools of thought, Bruce Wayne died the night his parents died; from that moment on he was Batman, and ‘Bruce Wayne’ became the mask.” This is certainly a compelling argument with a subversive impact, but it only works if we proceed with the supposition that Bruce Wayne is completely insane. A sane man does not assume the personality of a night-time crimefighting vigilante and relegate his “getting by” personality to that of a billionaire businessman. And, of course, there are people who would argue that, yes, Bruce Wayne is insane, that The Bat has taken over and subsumed his personality like Norman Bates’s mother. After all, Batman has always been a comic about insanity, far more than any other superhero title. The only thing that all Batman’s villains have in common is that they are stark raving mad. As a matter of fact, George Clooney once pitched a Batman movie to Warner Bros where it would be revealed at the end that, a la Sucker Punch, it is Bruce Wayne who has lived in Arkham Asylum all these years, fighting his never-ending war on giggling psychopaths from the confines of a padded cell.